Scientists at the Stanford University School of Medicine in California are researching a perfectly formed skeleton. In and of itself, there’s nothing unusual about one of the most notable medical research schools in the nation studying a skeleton. This one, though, is just six inches long. It was deemed so weird that many speculated that it was alien. It’s not. The skeleton, nicknamed Ata, is human. Scientists even know that she’s female and they initially thought she was 6 to 8 when she died. Ata’s remains were discovered about 15 years ago in an abandoned town in the Atacama Desert in Chile. 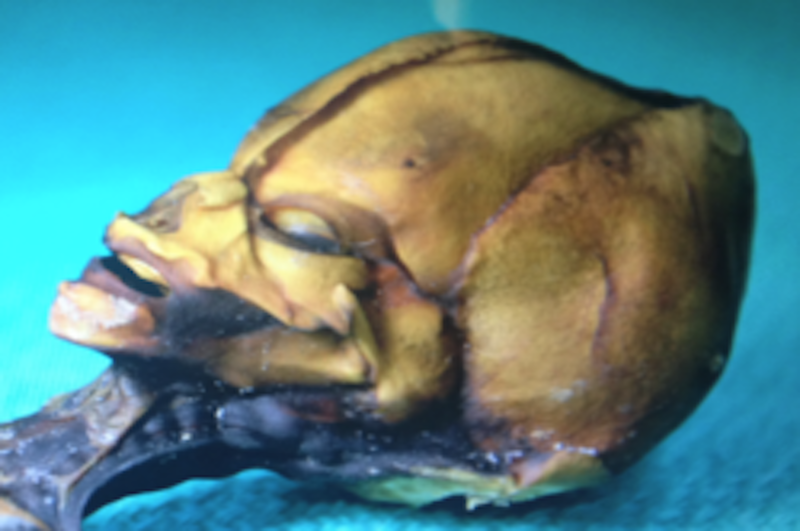 What is the Alien Mummy, Really? An amateur collector in Chili ran across Ata inside a white cloth in a leather pouch. Aside from the unusual size, it was almost perfect. Ata had a full set of hardened teeth. She had 10 ribs instead of 12, like most humans. She also had huge eye sockets and a long skull that ended in a point. It was claimed that this was possibly the mummy of an alien. Nolan asked the producers if could look for DNA. While the skeleton is still owned by the collector, the owner agreed to let Nolan take X-rays and bone marrow samples from the ribs and right humerus. Surprisingly, Ata’s remains are only about 40 years old. Scientists were able to extract DNA, which was entirely terrestrial, and entirely human. Ata was not 6 to 8 when she died, though. She was just a fetus, but she had a rare bone-aging disorder that made her seem much older. Where Did the Alien Mummy Live? Technically, Ata didn’t live, but if she had been born alive, she would have lived near the place they found her remains. She shared DNA with indigenous Chilean people and non-native caucasian people. Why Does the Alien Mummy Look the Way She Does? Ata had several bone deformities, including skeletal dysplasia (dwarfism) and facial malformations among others. Some of the mutations were especially fascinating to scientists because they’ve never connected the mutations to bone or physical disorders before now. How Did the Alien Mummy Die? Scientists don’t know exactly how Ata died, but it’s pretty clear that even she had made it outside the womb, she wouldn’t have lived long. Her bone structure simply wouldn’t have supported her organs. Nolan and his team have a lot of hope for Ata’s discovery. Genetic science is still relatively new. Far too often, scientists see a single mutated gene, or search for a single gene, and assume that’s the cause of disease. As Ata’s skeleton has shown, though, many genetic disorders can come from a series of mutated genes. There are sick children who may benefit soon from the discovery of Ata. Doctors and geneticists should cast broader nets in the search for genetic abnormalities. Featured image via Wikipedia Fair Use. For more information, you can read the study here.